It's their party and they'll give you Tempura cos they want too! I’ve been fortunate to grow up around great food. Saisaki and the Triple V group have been synonymous to YUMMY tempura. When we hit the buffet table, it’s one of the things we beeline to. In fact when they put it on the buffet table, it gets whipped out in a span of a few minutes only. I’m proud to say that the restos are celebrating another birthday and this year, they’re doing things differently. For the 33rd anniversary, indulge in your wildest dreams and engulf all the tempura your tummies can take. 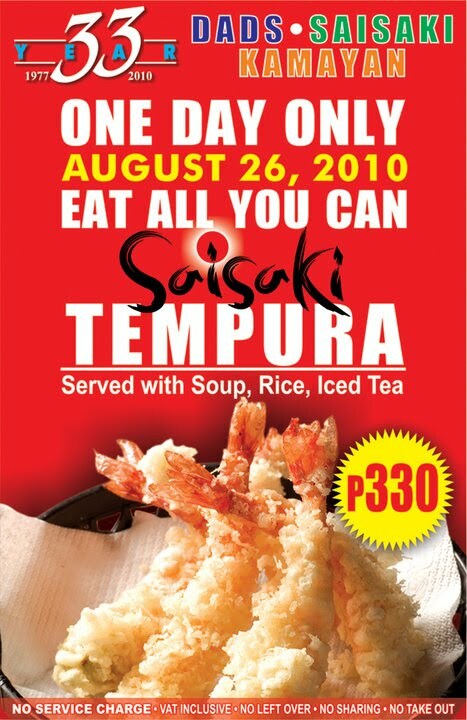 For the first time and a ONE DAY ONLY affair, enjoy all the Tempura you can take for P330! This deal comes with rice, soup and iced tea. EAT ALL YOU CAN SAISAKI TEMPURA ON AUGUST 26, 2010!! Where will you be on August 26?